For over twenty-five years, he has had the unique ability to deliver a serious message through laughter to millions of Americans via videos, personal appearances, daytime and late night television appearances, infomercials and books. 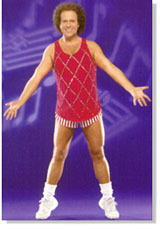 Because of this, Richard Simmons has become the nation's most revered fitness expert. One of the greatest attributes of Simmons' success is his ability to meet the changing needs of his audience. Over the past 25 years, Simmons has released more than 30 videos. He is the author of nine books, including the New York Times Best Seller, "Never Say Diet", Richard released his autobiography, "Still Hungry - After All These Years" in 1998. He is also the author of 3 best-selling cookbooks.